There are definitely some advantages to being technically-minded and able to put raw materials together into something new. For one completely insane DIYer named Colin Furze, this ability allowed him to create three very dangerous but very cool “‘toys” straight out of the X-Men movies (or comics, if you’re an X-Men purist). 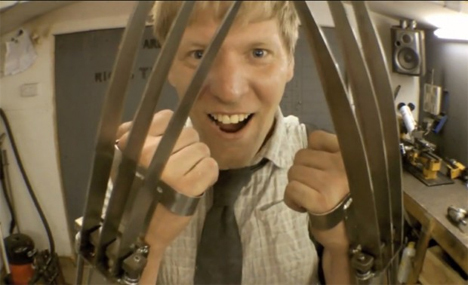 Furze’s Wolverine claws are fully extendable and retractable using a simple button in his hand. They are housed in metal guards that fit over his forearms and powered via a pressurized air tank stored in a backpack. According to Furze, they are the world’s first fully automatic Wolverine claws that deploy and retract on command. Finally, in what is definitely his neighbors’ favorite project, this crazy tinkerer makes himself into Pyro by creating flamethrowers attached to his wrists. We honestly can’t decide whether the flamethrowers or the very sharp 12″ long pop-out blades are more dangerous, but either way, they make for some very entertaining watching. See more in Do It Yourself or under Technology. July, 2014.